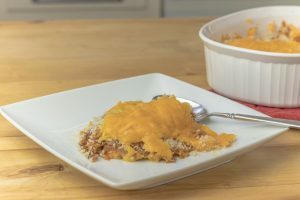 BBQ PULLED PORK MAC AND CHEESE – with VIDEO – Chandler Foods Inc.
Heat the mac and cheese in a sauce pan and pour into a casserole dish. Bake in the oven for 10 – 12 minutes at 350 degrees. While baking, heat the pulled pork with the bbq sauce, stirring occasionally. Mix the panko with the butter and some salt and pepper. Top the mac and cheese with the pulled pork and sprinkle the panko topping on it. Return to the oven until topping is slightly golden. Top with cheese and place back in the oven until the cheese is slightly melted. Makes 3 servings.